MUMBAI: It would be ignorant and unfair to treat a Suraj Mani album in a typical manner- few tracks sewn together with a uniform mood wrapped around every track, gradually emoting the essence of the entire soundtrack, as a story. Nope, in fact, Mani's compositions reflect out as individuals attempting, desperately and beautifully, to share an important story. Mani and The Tattva Trip intend to carry these stories and perform for the people in Delhi and Gurgaon on 20, 22 and 23 January. Call it a habit or forte, Mani manages to steer his lyrics towards a poetic conclusion without sounding too intricate or pretentious. With over 50 poetries on his official blog, it is difficult to deny the magnitude of lyrical importance that has occupied Mani's musicality and the journey so far. Mani's 'Motherjane' days are history- a remarkable one at that- but what continues to follow the 'artist poet' post-Motherjane days could be shortlisted to evocative songwriting, the distinctive voice, and the desire to express in the most natural way known to him. Before the frontman boarded the flight with the band for their first gig in the north, Mani spoke about The Trippers, lack of lyrical creativity and what inspires him to write. What attributes have you managed to explore about yourself that you couldn't/didn't with Motherjane, if any? "Well, I don't know if I could say I was limited with Motherjane because at that time, I wasn't. As of today, being solo allows me to just think up something, watch it turn into a poem and then a song. I think the big plus is that playing the guitar frees me to compose and capture what the poems mean to me." 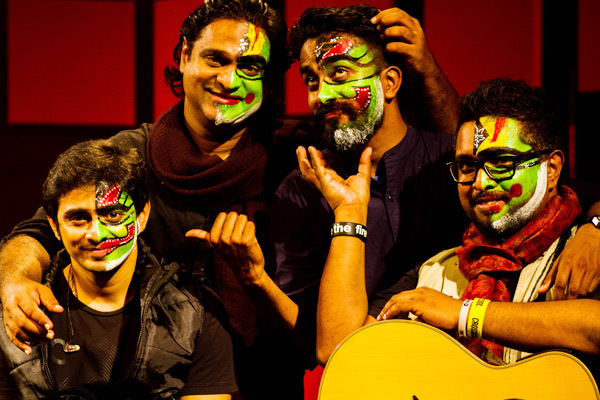 Mani belongs to 'that' set of musicians- the Eddie Vedders, the Bob Dylans, and the Raghu Dixits. The emphasis remains on the lyrics, although the rest of the composition does not fall into the 'second' priority. Mani is an 'artist poet' and there's a vital difference between the two, as Mani points out. How different is an artist poet from a songwriter? "A very small difference and essentially one of direction. I'm a poet who puts a melody to poetry whereas sometimes songwriters put words to their melodies ." Running a solo project is a completely different ballgame. The success through Motherjane guaranteed several bonuses, but what Mani counts as 'one of the best bits' of the journey with 'The Tattva Trip' does boil down to compatibility and the unified goal of, ultimately, depicting the song as the hero. 'Mahabali' has a lot of positive, dance-y vibes to it. On the other hand 'Tribes of Babel' has a very intense, dark vibrations to it. And then there are Trippers' tracks that cover the other moods. What message (of your sound and identity) are you conveying? Or is there no conscious decision taken, instead follow what naturally comes to you? "For us, the song is the hero and the writing, composition & instrumentation is all about serving the song, hence the diverse directions of the trip. In many ways the tattva trip is a symbolic representation of life itself and hence step in if you are open to it." The lack of lyrical creativity or serious songwriters in the mainstream space would fail to come as a surprise to many, but does that extend to independent musicians too? "Unfortunately, you have a point. One that is rectifiable though. What India needs are serious lyricists and poets offering up their work to bands that can put music to them. I recently made this point to renowned author Anita Nair and as an experiment took one of her poems 'You said, I agreed' and made it a song. It's been a successful experiment and I'm hoping it will inspire more such music." Mani leaps through cultures and resources to find inspirations, and more often that not, literature always reach out to the songwriter in the most effective fashion. Be it a book by a renowned German author or a relatively lesser known writer from Kerala, Mani never hesitated to share good art through the element that Mani knows best- singing. One of Mani's recent tracks- You Said, I Agreed- originally a poem by Anita Nair, carries an interesting story. "I interpreted what it meant to me. The moment I read it I sensed a bittersweet song with a lot of unstated regret in it. And it has a blistering solo at the end that somehow states all that is unstated. Gives me the goosebumps." So who does Suraj Mani could listen to all day? "Junkyard Groove, Lagori, Mad Orange Fireworks, Mahesh & The Mix, Masala Coffee, Parvaaz, Peepal Tree, Raghu Dixit, Soulmate, Thakara, Thaikuddam Bridge. There are enough artists for aspiring musicians to look forward to. What we want and deserve is the occasional mainstream appreciation." On a lyrical level, the scene may still need to grow, but Mani believes the rate at which live music is consumed has definitely impressed him. Have things finally begun to be a bit pro-artists these days- with the arrival of channels like Music Mojo, Balcony TV- where any talent could express itself? Plus, the number of festivals are doubling every year. "Oh yes. I feel that we are on an upswing. There is a definite appetite for classy music festivals and given the no of states we have, 50 odd festivals will be easy to pull off. I think the important thing is to make meritocracy drive all these efforts. It's not the cheapest talent or sound guys or production team or sponsors that are gonna attract the finest audience, it IS the ones who are pushing the envelope. One corporate shift that I'd like to see happen in India is the embrace of excellence and I think, once we as a music industry can make that a given, we would have done our countrymen proud." "On behalf of my fellow musicians, I shouldn't pass the opportunity to say this, "Piracy doesn't kill, Pirates do". And a lot of great musicians are dying even while alive." 23rd January at Sandys bar & Kitchen, Gurgaon.